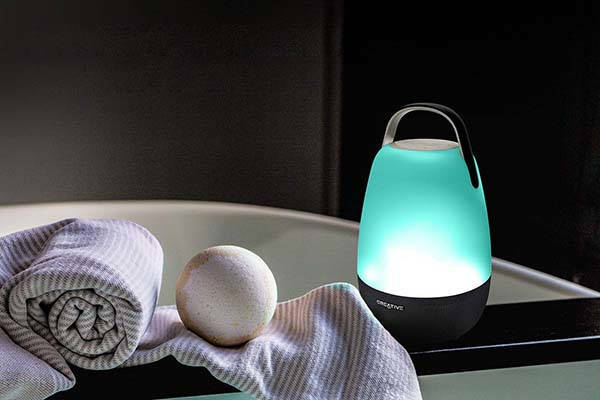 Creative Nova portable smart speaker not only delivers your favorite music, but also brings many intelligent features with built-in Amazon Alexa, and it works as a LED lantern. Cool? Let’s keep checking. The Nova is a beautifully designed and advanced wireless smart speaker that measures 7.1 x 7.1 x 12.1 inches and weighs 4.22 pounds. 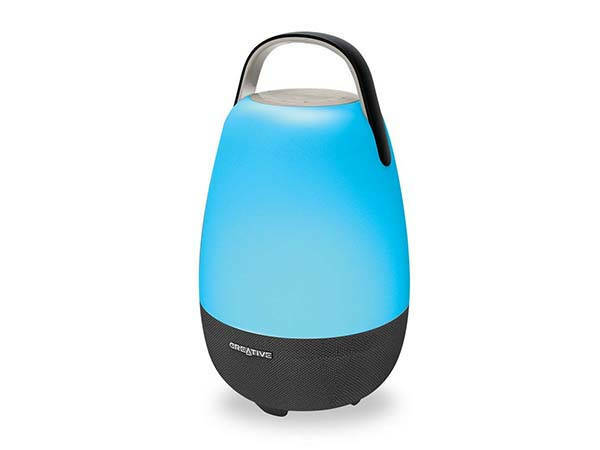 As we can see from the images, the speaker shows off a minimalistic and elegant appearance design, and with the integrated carry handle, you can easily move it from one place to another, and built-in rechargeable battery even allows you to enjoy music outdoors, while IP55 water-resistant design allows it to fit for your pool parties or camping trips. The portable smart speaker comes equipped with two 8W far-field drivers, one 15W down-firing woofer and two passive radiators in order to produce balanced room-filling audio. Furthermore, with both Bluetooth and WiFi connectivity, the portable wireless speaker not only wirelessly connects with Bluetooth-enabled smartphone, tablet or other devices, but also directly streams music online without connecting your phone, and it supports Spotify Connect, iHeartRadio, TuneIn, Napster, Amazon Music and Tidal music streaming service. Moreover, using built-in Amazon Alexa, you can ask the smart speaker to remotely control your music playback, search your favorite music from the Internet, read fresh news, check real-time traffic info and weather forecast, interact with other Alexa smart home devices in you home, and more. With built-in RGB LED light, the Nova acts as a portable LED lantern. Using 16.8 million colors, the LED lantern can always soothe your mood and relax your mind. In addition, built-in rechargeable battery offers up to 7-hour playback between charges. The Nova Alexa portable smart speaker is priced at $149.99 USD. If you’re interested, jump to the product page for its more details.